Ahoj and Greetings from Slovakia. I can’t believe it is already October. I want to again thank all of you who have and continue to support me through prayer. It helps to know that we are together in the Lord despite however far apart we may be. Please continue to pray for me and the other young adult volunteers around the world. Having been in Vrbovce for about 2 months, I am starting to become familiar with the people and customs. I feel like I have a place in the village. Here is a small list of things I enjoy about living in Vrbovce. As I struggle with learning the language one word that I keep hearing and repeating in my head is “Pomaly” or slowly/gently. The word has made me think a lot about how I think about and do things. We all have a tendency to want things fast and in a hurry. I am enjoying the slower pace of life and learning how to enjoy the small moments and experiences. I am learning to spend time with people, listen even if I don’t understand very much and take things as they come instead of trying to stick to a schedule. I am reminded of one occasion when Oliver, Flo and I were on our way to the school to eat lunch when one of the neighbors needed some help. So we stopped and helped her haul several bags of potatoes. It was a rather small favor. She then invited us for Kava (coffee). Not being masters of the language we couldn’t politely say we had to go eat lunch at the school. So we had coffee, which then turned into lunch. I am often overwhelmed by such kind and random hospitality. I can see Christ reflected in the small things, like being invited for coffee and it turning into lunch when we didn’t even do very much to deserve it. This is only one of many such stories. I have never been a huge fan of wearing sweaters. As the weather gets colder I am finding the layer system quite wonderful, which often includes sweaters. 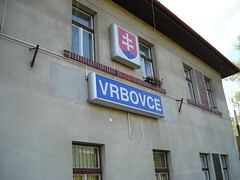 One of the big things in Vrbovce is the Cultural Hall. Every village in Slovakia has one. The one in Vrbovce is rather run down and is right now being used for storage of the many things donated from Germany or other parts of Europe. These items include useless medical equipment, beds, furniture, lights, and clothes. We are often asked to move things or thrown things away as the process of cleaning up and renovating the culture hall is starting to take place. The villagers are appreciative of any work that we do and often give us cookies, cakes or Slivovica. Many fun times have been had looking at old junk and sometimes taking things for our own use. One time we made an imaginary car from some old junk and proceeded to make fun of our daily lunch run. Many things are rather ridiculous but, a warm sweater is a warm sweater and a nice couch is a nice couch. I look forward to helping in the renovation process and seeing what will happen. I teach once a week at the local school where I assist with 2 English classes and I am teaching some of the local village youth how to play drum set. Both have been an interesting experience. I am struggling to understand and communicate with the children but I am understanding and speaking more everyday. Many of the kids try to joke around with me and are interested mostly in learning “Dirty Verbs” as they call them. I try my best to teach them proper and clean English. One weekend Vrbovce had its annual Jarmok (Market). The center of town was filled with many people and vendors were selling things on the streets. Clothing, Food, Handicrafts, etc. I saw many familiar faces from the school and from church. The night before we had decorated cookies with the youth group which were sold at the market. I had the opportunity to buy some raffle tickets from the school. I didn’t win anything but; standing in the cold weather surrounded by tons of people listening for my number to be called in Slovak was exciting. I look forward to sharing many more stories with you as the year unfolds. As much as we want to change the world we must first let Christ transform us. God has chosen US to be a part of global transformation. It isn’t easy; it is never easy to change. Christ’s ultimate goal is that hearts are transformed by his grace. We start by learning to really love others and ourselves as Christ loved. I am here in Slovakia not to change the people around me but, to let Christ change me so that his love may be shown to those for whom I am called to witness. Learning to Be Loved and To Love. Learning to see Christ in others and ourselves. Dying to sin and being Raised again to Live in God’s Mercy. That is what we are called to as Christians. That is our Mission. God’s unbounded love be with you.